It's a good thing that Heidi suggested that together we do a post on our UFO's. For me it was not only a way of going through my stash closet and re-organize, to be reminded of what I already have, but to be faced with projects that once made my tail wag and for some reason or other got pushed aside in favor of a newer and shinier project. Most of these are from my early days as a quilter - not that I'm a seasoned one, it's been only 4 years or so since my daughter asked me if I would make a quilt for her bed, as I was sitting at a spinning wheel. I was surprised by the request since I didn't sew at all, and up until then only knitted and spun wool. But a quilt she got, after I had taken a private class in a tiny quilt shop found by accident whilst on summer holiday in France during a terrible heat wave. That started a love affair that continues to this day with bits of fabric, colors, textures and forms. As I mentioned before, I've been a knitter since knee-high to a grass hopper and a big fan of Kaffe Fassett and Rowan knitting patterns. 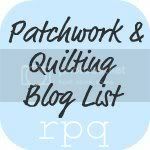 Only natural for me to have his book, "Patchwork" as the first of my quilting library. This quilt is for Ro. It's practically finished but riddled with mistakes ( I have to add fabric to the back as I didn't know then that the backing and batting had to be larger than the top) but the quilting is nearly done. Sampler blocks from my first quilting class. Here it's clear there was lots to learn about lights, mediums and darks in fabric, which work differently than when knitting a sweater! It's been laying about because, again, it's got plenty of mistakes, and I lost the yellow silk needed to complete the border along the baby blocks, but miraculously, when I went back to the store where I had originally purchased the fabrics, the owner, crawling around on hands and feet, found a box with the exact piece of silk that she had left over! No excuses now, huh? 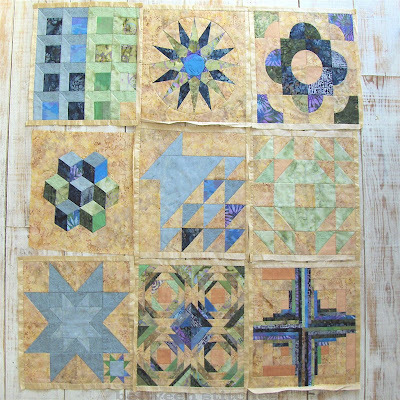 Another bold project: and blocks for an ocean waves quilt, one of my favorite patterns next to the log cabin. 36 tiny star blocks for yet another ambitious project. For a while I carried the tiny pieces around, piecing them in the car, on visits, while waiting somewhere. Why can't I just make small quilts? Why must they always be queen size? I'm learning....LOL! And now, an applique project. Four blocks completed. I think I stopped because although I loved doing it, I always had to sit at the table to work, and it was much more fun to join the rest on the couch in the evening and stitch. It's a wonderfully simple design I'd love to complete. Paper-pieced flowers: painstakingly slow to make, but fun nevertheless when the pattern emerges. I just got tired of drawing, cutting the tiny paper diamonds and triangles needed that fit between the flowers. Who knows if this will ever become a quilt, or something else? Last, but certainly not least, is one of the projects I'm most proud of, my Texas Star. The star itself is made from Indian woven cotton, of which the warp and weft are different colors. This gives the effect of the colors changing as you walk by the quilt. The background is textured Japanese fabric. The reason I'm so proud of this quilt is that it laid flat after holding my breath as the last stitch of the background went in. It's made completely by hand, and this one is next in line to be worked on. It's been in the closet purely because I didn't know if I wanted to add anything to it such as an applique. Now I want to get is sandwiched, and that will be my quilting project this winter. Phew! Well, there you go. My confession. Oh my goodness, each and every one of those WIPs is marvelous. I had thought about doing a quilted item for my PIF to you, but now I must re-think that. My work is so shabby in comparison to yours. I would be ashamed to send you any of my quilting. So I am back to the drawingboard...just so you know that I have not forgotten you! You've got some gorgeous projects there!! 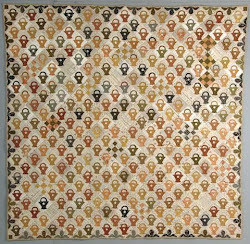 Heidi your quilting is wonderful. 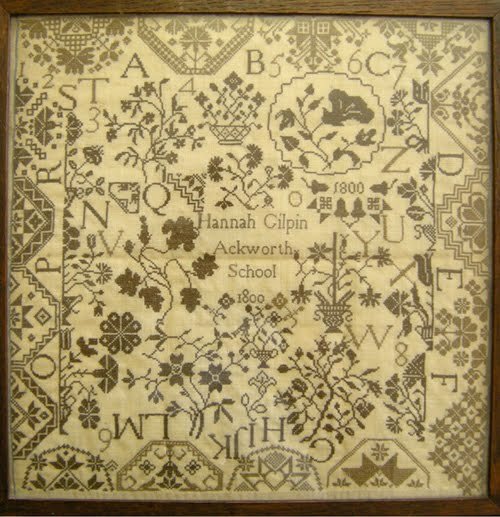 I have never tried to quilt - looks far too complicated for me! I will just have to buy one of the beautiful ones I saw in an Amish store in Florida last year. The store was closed that day and we were leaving early the next morning - maybe a good thing as I expect they were mega dollars! What lovely work you have there. 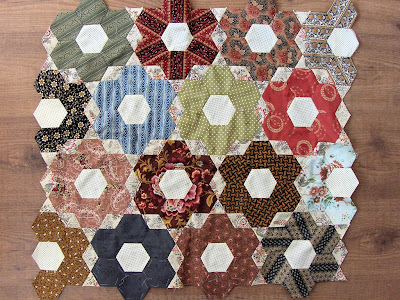 I especially love the hexagon flowers - the little pieces that set them apart are really sweet. That is a fantastic achievement to have hand pieced the Lone Star - and it sat flat - as a fellow patchworker, I know that is not always the end result :-) And I'm with you - I seem incapable of making anything small and finish-able! You bad girl Heidi! I now want to add another to my list as I love your miniature hexagons. I did not even list my hexagon quilt on my list. Oh that list would be way too long if I was really honest. LOL! I am glad we both confessed. It has also given me great vigor to work hard. How about you? What a beautiful quilt. 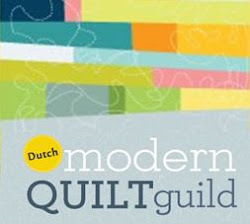 I am just a starting quilter, since octobre 2007. I have lost of patterns on my wishlist and the lone star is one of them. The colour of yours are a inspiration.